In addition to booth space, exhibitors are encouraged to take advantage of all marketing opportunities available to them when taking part in a Marketplace Events produced home show. Aside from the standard show guide listing during the event, we also provide a listing on the home show website. The exhibitor listing remains active from the time you sign up for your booth until the end of the renewal period after the show closes. Many of our exhibitors have experienced great success with their website listing. Visitors to the home show website are able to contact your company directly through this tool - therefore it is an additional method available for you to generate sales leads before, during, and after the home show. In addition to the "Request Information" form on your listing you also have the option to provide your social media accounts (Facebook and Twitter) along with a link to your company page on the Better Business Bureau website. 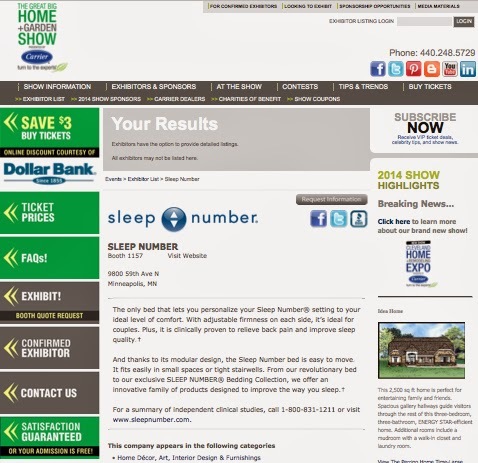 The exhibitor listing pages help both customers and businesses connect before and after the home show. If you have booked space in an upcoming Marketplace Events home show and have not yet submitted your listing, please reach out to your sales consultant for more information and they will provide you with the login password. When setting up your listing, follow these handy tips! Enter a full description of your company - The more information you provide the better as it will help visitors find you using the search tool. Use as many keywords as possible - Keywords will help you appear in the search results. If you sell different types of products... List them all! Select the category that best represents your company - You will be listed under this heading. Include your booth number - Make sure customers can find you at the show. Offer a show special or discount - Use a promo code or offer a percentage off to people who mention your listing. A great way to track the results! Follow up with email requests - Be sure and reply to potential customers who submit requests for more information. Why not make appointments with them during the show? VISIBILITY - Receive a full page on the home show website! Detailed company information will remain live for the entire show season. SALES - Consumers can contact you by searching and emailing you directly using the submission form. Visit HomeandGardenBlog.com for tips + trends! Celebrating Marketplace Events Award Winners at #MPEDisney! Toronto Exhibitors: Come celebrate with us! Our events provide an opportunity to share your product and/or service with consumers on an individual, face-to-face basis. This puts you in the driver’s seat! You can tailor your selling points to the needs and wants of each consumer… one at a time. No other marketing vehicle affords this unique and powerful approach. Plus, our show teams are always ready and willing to help you achieve your goals!